The Superior 100 Mile Trail Race has been aptly described as the “Superbowl of Midwest Trail / Ultrarunning” – the point to point 100 mile trail race is paired with two of the most challenging and scenic 50 mile and 26.2 mile trail races in the country. Minnesota’s Superior 100 was established in 1991 as one of the original dozen 100 mile footraces in the United States and is considered one of the “legacy” 100 milers. The races reach goes well beyond the region having throughout the years earned a reputation as a national class event, drawing runners from 36 states and 5 countries. All available spots for the 2015 race were filled via a lottery over a 10 day span six months in advance of the September event. The race is frequently cited for its unparalleled volunteer support and for striking the right balance between refined management / execution while maintaining a fun, low-key atmosphere as can only be achieved when a race is passionately produced by ultrarunners for ultrarunners. Those that experience the “Superior Fall Trail Race” weekend once will almost certainly find themselves back year-to-year as runners, volunteers, pacers or spectators – as a result there is a very strong community and culture that has flourished around the event. The Superior Trail Race ardently supports and proudly donates hundreds of volunteer hours while making significant financial contributions to the Superior Hiking Trail Association annually. 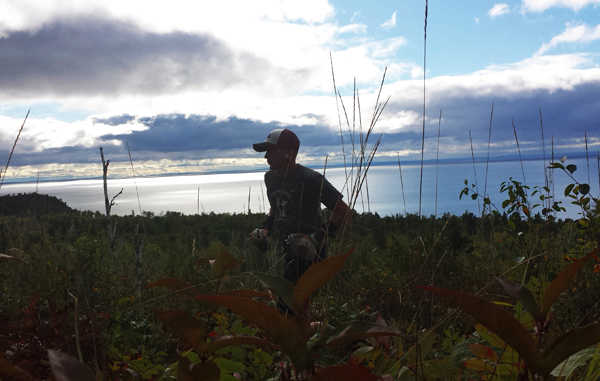 Following is a recap of the 2015 Superior 100, 50 and 26.2 mile trail races. Thursday nights 100 mile pre-race meeting and dinner in Two Harbors Minnesota saw (retired) race founder and 12 time Western States finisher Harry Sloan (along with his Co-Director Tami Tanski-Sherman) inducted into the Superior Trail Race Hall of Fame. What made this extra special was the fact that the following morning, at the age of 67 Harry was for the first time running in the race he created – hoping to make the Superior 100 his “swan song” or better yet, knowing Harry his comeback at the 100 mile distance. The “pre-race” is an event in itself with an electric atmosphere where runners have the opportunity to catch up with old friends before the race and a decent amount of humor and entertainment is injected into the runner briefing. As is customary, the pre-race meeting concluded by recognizing the total number of 100 mile finishes of those in attendance. The three that got everyone’s attention were Stuart Johnson of Shawnee KS embarking on his 18th, Susan Donnelly of Oak Ridge TN starting her 15th and Christopher Hanson of Nisswa MN starting his 11th – these three runners are the only living individuals with 10 or more finishes at the Superior 100 – notably, all went on to finish this years race and have stated intentions of returning in 2016. Superior Trail Race “hall of famer” Eugene Curnow (deceased) is the only other person to complete the race 10 or more times. As always a huge thank you was given to the races local / community partner, Lake County 4H for hosting the dinner and arranging for space at their building on the Lake County Fairgrounds. The Superior 100 is a race that is characterized by and revered for its rugged point-to-point nearly all single-track format, however the 25th edition of the race was to see the first 5 miles of the race starting out on the paved (yet very scenic) Gitchi Gami State Bike Trail which closely follows the shore of Lake Superior. This change was due to a temporary closure pending reroute of a section of the Superior Hiking Trail between Gooseberry Falls State Park (the race start) and the Split Rock River aid station (first aid station in the race) – this change also shortened this years course by an approximate 1/2 mile. Cruising easily through these early miles, runners enjoyed the relaxed start of the race and the ability to run two and three wide across the path while chatting with fellow runners before hopping onto the notoriously rooty, rocky and steep Superior Hiking Trail. Frontrunners were anticipated earlier than normal at the first and subsequent aid stations this year for two reasons; certainly the quicker early miles of the race on the bike path would contribute but another record strong field made this an inevitability regardless of the course change. Jake Hegge (Onalaska, WI), Michael Borst (La Crosse, WI), Samuel Jurek (Oak Bluffs, MA) and Dylan Armanaji (New York, NY) presented as clear front-runners early if not on-cue. After pacing his friend and training partner Borst to a 2nd place finish in 2014 Hegge pinned on his own race number this year and onlookers expected more of the same from the two insanely positive, joyful and energetic running buddies and waited for yet another CR to fall. Following through those early aid stations were a couple of not insignificant small chase groups of very experienced runners who would gladly pick up the pieces should any of the early leaders / race favorites falter. Running neck and neck through 100K, Hegge and Borst looked like they could be so evenly matched that they would bring it in together as they have done in past races, but this time as soon as the cracks crept in, it did not take long for chasms to form and Hegge stretched his lead in the pre-dawn hours – eventually smashing the previous CR and leaving little doubt that it would have fallen by a fair margin regardless of temporary course changes – Borst would finish 2nd his second year in a row. Somewhere mid-way through, third place runner and one of the race favorites Samuel Jurek hit a bad patch and he went down, no not falling down on the ground, but to sleep and in what ended up being one of countless inspiring performances throughout the weekend Jurek got back up and made his way to the finish, anonymously in the middle of the pack with the humble disposition of a gracious ultra-competitor. Filling Jureks shoes in third place was Alexandria Minnesota’s own Brian Klug – early on Brian looked like he was going to take it easy and not press the issue and by doing so methodically moved his way up the field throughout the race for an eventual 3rd place overall finish. Making it a little more challenging to write a compelling story, Canadian Mallory Richard was welcomed as the first woman through all 13 aid stations and went to convincingly defend her Superior 100 mile title earned in 2014 as the first woman and even notched a top 10 overall finish amongst the boys. A strong predictor of this performance was not only her defending champ status but that Mallory just months prior had won overall (against men and women alike) at the 2015 Black Hills 100. Tina Johnson of Milwaukee WI, impressively finishing her fourth Superior 100 took 2nd and her best time and place to date while first time Superior 100 runner Gretchen Brugman of Truckee, CA got to experience first-hand the difference between buttery California single-track and Minnesota boreal roots, rocks and unreasonably steep ascents void of switchbacks – she rounded out the top 3 with an impressive performance her first time racing on the uber-technical trail. As for Harry Sloan… someone at the finish summed it up best when they said “you just can’t make this stuff up” – at the age of 67 Harry battled two days and saw two sunsets to masterfully finish “his” race in 37:58:38 – just one minute and twenty one seconds under the cutoff . The energy and emotion at the finish line was palpable as many waited for the man to finish – we now consider the circle complete. The proposed date for next years Superior Fall Trail Races (pending final approval of all permits) will be on Friday September 9th and Saturday September 10th, 2016. Registration will be held via a lottery and administered with few changes from the 2015 race registration process. Registration is expected to open early in 2016.